Be prepared to explain something about Sacrament at your level - if you have a specific sacrament be prepared to share its signs and symbols. Also be prepared to share something you have done or could do as a learning activity at this level - something which will also enliven the spirituality of your students. 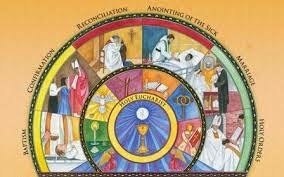 Read the theology for Sacrament at the beginning of your strand book. Be prepared to discuss this at the meeting. At the meeting we will make a "graduate profile" for the Sacrament strand and write an assessment.